Opening hours: Larger shops such as department stores are open from Monday through Saturday from 10 a.m. to 8 p.m. some remain open longer. On Sunday, shops are generally closed, with the exception of smaller souvenir shops. Filling stations (gasoline/petrol) and the main train station also offer a small selection of grocery and household products beyond regular opening hours. Heidelberg is considered one of Germany’s most beautiful cities. The harmonious ensemble of Castle, Old Town and river in the midst of mountains was an inspiration to the poets and artists of the Romantic period, and has lost none of its fascination today for millions of visitors from all over the world. 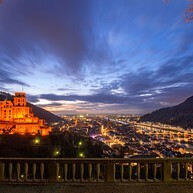 The symbol of the city, Heidelberg Castle, lies some 70 meters or 230 feet above the Neckar on the hillside of Heidelberg’s local mountain, the Königstuhl (King’s Chair). The ruins of the Castle towering above the town are among the most impressive sights that a trip through Germany can offer the marveling traveller. The city of the oldest university in Germany (founded in 1386, and since 2007 officially a University of Excellence) looks back on more than 800 years of history: from the former residence city of Germany’s Prince Electors up to today’s modern and future-oriented center of knowledge and economic growth. 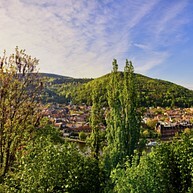 Among other achievements, in 2007 Heidelberg was the nation-wide leader in the conservation of nature. The Castle was erected on a medieval fortress complex high above Heidelberg. For five centuries, the powerful Prince Electors of the Palatinate region, members of the House of Wittelsbach, resided here. In 1693, during the War of Palatinate Succession, the Castle with its towers was destroyed. The magnificent ruins became the symbol of an entire epoch, the German Romantic period. Today during the annual summer Castle Festivals the Castle is an enchanting stage setting for numerous open-air performances. 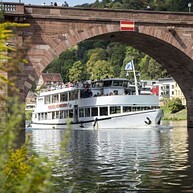 Whether you are exploring Heidelberg for the first time, rediscovering your hometown or seeking a mini-vacation, a White Fleet cruise is a relaxing way to see one of Germany´s most beautiful townscapes. There are numerous cruises to choose from. During our tour of 40 minutes up to three hours you get great impression of Heidelberg, the castles in the Neckar valley, the Mannheim harbor or the Old Rhine at Worms. Charter: Are you looking for a special location for an event or a festivity? Client parties, Corporate events, Private group trips, Weddings, and so on.. Great music, food, laughter and constantly changing scenery will make your celebration one to remember. We assist you in planning your special event. Please contact us for more detailled information about buffets and prices. 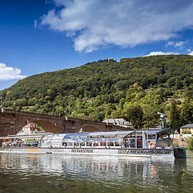 The ship (length: 36,90 m) on the Neckar River is powered by solar energy. The passengers experience the most delightful views of the city while the ship gently gildes by. The views are only enjoyable from the waterside. This is an environment that makes the trip the experience. Additional to the fascinating round view the ship offers many pleasant comforts: two bistros, PA system, and toilets. The largest and most modern solar steel ship in the world. Its maximum capacity is 200-250 persons. There are approximately 150 seats in the heated interior and 100 more available on the outside deck. The ship and the pier are both handicap accessible.” Charter Trips: You can also rent the solar shuttle for private charter trips. The commodious interior is ideal for bus and travelling groups. Weddings, meetings and all kind of group-events can be celebrated on board. Gliding on the Neckar River every event becomes a special highlight. We would be glad to support you in questions of catering, decoration, program and route. The "Heidelberger Liebesstein" is an Odenwald sandstone which stands on the north side of the Old Bridge. Couples in love can fix an engraved love lock there to seal their eternal love. The engraved love locks seal the eternal love of couples. According to an old tradition, couples close the lock together and throw the key into the river. 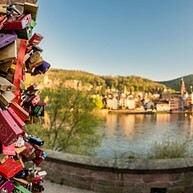 The view through the love stone opens up a unique photographic perspective of the romantic landmark of the city - Heidelberg Castle. 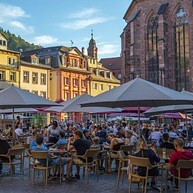 The oldest part of Heidelberg has far more to offer than the Alte Brücke (Old Bridge), the picturesque alleys and the unique view of the world’s best-known ruin. In the Old Town, dreamy squares are linked like beads on a necklace, with people of all ages and from around the world meeting in the many small cafes and pubs. A unique cultural offer beckons with museums and theaters as well. Let your guide take you on a tour of exploration to really get to know Heidelberg. You will first receive an unobstructed view of the “Stage Heidelberg”. Let your gaze wander up to take in the Romantic Castle, majestically towering above Karlsplatz (Carl’s Square). This is followed by a comfortable City and Castle Sightseeing Tour with a tourist guide along the River Neckar to a photo stop at the Alte Brücke (Old Bridge). Later, you will see Heidelberg Castle close up, with an outdoor tour in which your tourist guide will introduce you to the history of this fascinating building. You will see the inner courtyard and the famous Large Barrel. After the tour, you can visit the Deutsches Apotheken-Museum (German Pharmacy Museum) and then enjoy the ride with the funicular railway back to the Old Town (valley station Kornmarkt (Grain Square)), which is included in the Castle ticket. The Segway Tour opens up an entirely new perspective. Glide along the River Neckar to the historical and trendy quarter Neuenheim with a tour guide. From there, you will continue towards the zoo and through the Neuenheimer Feld, with its impressive university and hospital buildings, and up to the Philosophenweg (Philosophers’ Walk). This Heidelberg sight is not easily seen at first glance. 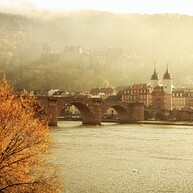 The former vintners’ path was once taken by scholars who desired the inspiration of the “Heidelberg Triad”: The harmony of the Baroque city, the Castle and the River Neckar. It’s an extraordinary view! Together with its famed Bridge Gate, which was once a part of the city wall, the Old Bridge has always been a symbol of Heidelberg. The statues of Karl-Theodor (who built and gave his name to the current stone bridge) and of Pallas Athena, the goddess of wisdom and culture, stand enthroned here above the Neckar. The Bridge Monkey, re-erected in the 1970’s on the Old Town side of the bridge, is one of the most popular photo motives. On the closest bridge column, below the statue of Karl-Theodor, are chiseled the impressive flood markings of recent centuries. Philosophers’ Walk is considered one of the most beautiful walkways in all Europe. The famed pathway that meanders along the sunny side of the Heiligenberg has inspired countless scholars and poets through the centuries, and today offers visitors an unimpaired view of the castle and town, as well as numerous benches on which to linger and enjoy the matchless panorama. Above Philosophers’ Walk is the Heiligenberg, 439 meters or 1,440 feet above sea level. On its the many footpaths, visitors can explore the still partially preserved celtic ring wall, the Roman Temple of Mercury, from the Mithra cult, the Thingstätte – a gigantic open-air stage from the time of National Socialism – and the ruins of the monasteries of St. Michael and St. Stephan. Aim High – Reach the Top with the Heidelberg Funicular Railway For over a hundred years, a ride on the Funicular Railway, has been a special experience in Heidelberg. From the romantic Old Town, the railway takes Heidelberg’s visitors and residents first to the Castle station, then to the Molkenkur station, and finally to the top of the Königstuhl (King’s Chair) Mountain, at a height of some 400 meters or 1,300 feet above the Neckar valley. Along the way there is much to discover. With the attractively priced Castle Ticket, the newly renovated railway transports you quickly and comfortably to the Castle and back again to the Kornmarkt station. 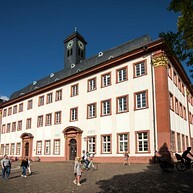 The entrance fee for the Castle courtyard, the Barrel Cellar, and the German Pharmacy Museum is included in the price. Those wishing to go higher can take the railway up to the next stop, Molkenkur. Here, where in earlier times guests partook of a coveted whey cure (Molken-Kur) in the hotel, today’s visitor can enjoy coffee and cake on the spacious, sunny terrace looking onto the town. While the lower funicular presents its streamlined form in dynamic silver grey, a change of trains at the Molkenkur station propels you into nostalgia. From here onward, the historic original car designed of venerable wood in 1907, and completely restored in 2005, takes the visitor to the peak of the Königstuhl and the surrounding forests. The spectacular view, from a height of 567 meters or 1,860 feet above sea level, is sublime. 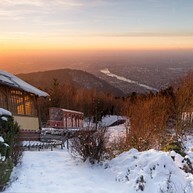 From the terrace of the funicular station, the panorama stretches over the entire Rhine-Neckar area to the chain of hills of the Palatinate Wine Route. In the Alte Aula, the hallowed old lecture hall of the Old University building, famous graduate students have defended their doctoral theses and received their degrees for some 300 years. Today the Alte Aula is the ceremonial hall of Heidelberg University. Mural paintings on the ceiling and front wall of the wood-panelled room represent the history of Germany’s oldest university. On the ground floor of the building, the three exhibition rooms of the University Museum trace in pictures, documents and German texts the history of the University. From 1778 to 1914, the university’s young students were briefly imprisoned here for minor offenses, such as willfully disturbing the peace of the citizenry. Many of the inmates passed the time away by immortalizing themselves on the walls of the prison with drawings, silhouettes, and expressive phrases. Their spirited artwork can be admired today on a visit to the prison. A combination ticket is available for entrance to the Alte Aula and the prison (Karzer). 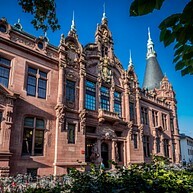 The red sandstone facade of the library, adorned with sculpted figures and portraits, proclaims the significance of the building that presides over some 3 million books. Within, the staircase landings display carved busts of famous scholars, and the library’s regularly changing exhibitions invite a closer look. A special attraction is the "Codex Manesse", the world-famous medieval collection of secular Lieder which once was part of Heidelberg’s Bibliotheca Palatina. One of the city’s oldest squares, Market Square is framed on the east by the town hall and on the west by the Church of the Holy Spirit. In the center of the square stands the majestic Hercules Fountain, erected between 1706 and 1709 as a reminder of the immense efforts required to rebuild the city after its almost total destruction in the War of Palatinate Succession, 1689-1693. The Church of the Holy Spirit was constructed from 1400 by Ruprecht I as both a collegiate church and a final resting place. The distinctive feature of the church is its loft galleries, where originally the famed Bibliotheca Palatina was housed as a safely enchained library, until its abduction and transport to the Vatican in the Thirty Years’ War. Today the Church of the Holy Spirit is the city’s main Protestant church, and attracts visitors in large numbers to its concerts and church services. The Madonna statue on Kornmarkt was erected in the course of recatholisation efforts under Prince Elector Karl Philipp. Created by Peter von den Branden in 1718, the Corn Market Madonna is considered the most beautiful baroque statue in Heidelberg. On the western side of the Kornmarkt stands the stately Palais Prince Carl – from 1788 an inn, till 1915 one of Heidelberg’s leading hotels, today an event venue with a magnificent Mirror Hall - and on the far eastern corner is the pale yellow house of the French Count de Graimberg. Charles de Graimberg became by his own volition and immense efforts the conservator of the castle and the founder of the city’s art collections. Graimberg died in 1864, having lived to see his dream of preserving the castle come true. The triumphal archway in honour of Prince Elector Karl Theodor was erected at the eastern end of the city between 1775 and 1781, following plans drawn up by the court architect Nicolas de Pigage. The Elector himself was present for the laying of the first stone on October 2, 1775, and it was also he who prompted the architect to blend elements from three submitted drafts into a final fourth plan. 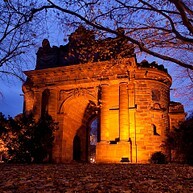 Thus came about a classical construction in the tradition of a Roman triumphal arch, crowned by four Palatinate lions. In the middle section of the facade facing the city are portraits of the Elector and his consort, beneath the electoral chapeau, while on the facade looking away from the city, the middle field bears the dedication inscription below a weaponry trophy with the coat of arms of the Electoral Palatinate. The sculptures are the work of Peter Simon Lamine. The gate was never entirely completed.